God longs for us to be dreamers. He created this world full of beauty and love so that we could see his hand and be inspired. He gave us hearts that long for pieces of Heaven so that we would seek it out for ourselves and others. He works through us in both muted and miraculous ways to spread his love, grace, and mercy to those around us. For some, we soak all this up, we are walking dream machines, we can’t shut off the idea mill and our bucket list is endless. Our problem is often focussing in on which dreams to chase and we will get to this topic next week. Then there are some of us are non-dreamers. We feel like we just don’t dream. Maybe we did before, but now, we are just going about our day to day wondering where the nearest dream store is so we can go pick up one and be like all those dreaming people with their bucket lists and inspirational quotes on their iPhone cases. 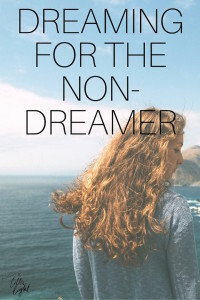 If you are a non-dreamer you might be facing these hurdles. . . .
Maybe you never had the safety to have dreams when you were younger. Maybe you stopped dreaming so you could focus on your life responsibilities. Maybe you just feel overwhelmed in your current season of life. Don’t let the pressure to ‘dream’ drive you away from being open and hopeful with what could happen in your life. The first thing you need to do is make room to dream. Pray that God will stir up your dreams. Seek out inspiration for all your senses. Cook food you love, get out in nature, listen to music, read great books, maybe get on Pinterest, plan something special to look forward to. Start listening to the small voice that says ‘I would love to do this today’, or ‘wouldn’t it be amazing if I could..’. Almost all of us have broken dreams, whether it was due to a loss, a rejection, a failure, or what we see as a missed opportunity. Sometimes God asks us to put a dream aside, sometimes he outright says ‘no’ to them. This pain can sometimes cloud over our ability to find a new path for our desires. To move forward after broken dreams we need to mourn the loss of that dream, we need to refresh our identity and confidences in God and his promises to us. We need to pray for a new sense of hope. Whenever I mourn my broken dreams, I think of Joseph. Joseph knew that God had incredible things in store for him but when he was sold into slavery by his own brothers, and imprisoned, and outright suffering, he remained steadfast. He knew that God had the birdseye view of the whole picture, he acted with trust in God, he believed that God would make everything work out for good in his life. Many Christians struggle with the balance of serving others and following their own dreams. We justify our dreams when they are ministry-related, but we forget that kingdom work also happens in the everyday normalcy. We can’t perceive that how we live our lives will impact the hearts of those watching us. Whether it is a DIY we do with our friend’s kids, a conversation with a fellow traveller, a little note in a blog post, making your co-workers a tray of cupcakes – it all might plant the love of Jesus in someone else’s heart. We can consider it all God’s work when we are carrying out our everyday lives to honour God. It can be difficult to navigate our dreams and the dreams God places in our heart so Christians tend to play it safe, which quickly leads to apathy. When we aren’t dreaming, longing, hoping, living passionately then we are lukewarm – for everything. God wants us to have hearts on fire for living the life he gave us. He fills us with unique talents, interests, and skills because he wants us to live a rich and passionate life. He wants to use us, just as he made us, for his purpose, for Kingdom work that is happening on the heart level. When we ask God to fill our hearts with his dream for us, he will, because then we can passionately and purposefully pursue our dreams with intentions that are God-focussed rather than self-focused. Have you ever found yourself withholding? I know I have. When we have been wounded, we self-preserve and put up walls. Maybe this is happening in obvious ways like resisting a conversation with someone or avoiding the chance to help them. Maybe it is in more subtle ways where we find ourselves withholding our gifts and our dreams from God and those around us. Maybe you know a dream that God has placed in your heart but you don’t want to even entertain it because you are preserving yourself. You don’t want to open up for God or for others. Maybe you have some silent resentment about how God gets to use you, some anger with the people who your dreams might impact. Maybe, if you are like me, you have fears that once you state your dream out loud you are accountable, you are scared of letting the world have the pieces of you that you would be sharing as you chase your dreams. We can work on trusting God with our hearts even when we don’t trust others. Rather than use the fire of our resistance to keep God and others at bay, we can turn this fire of our resistance into living more passionately as Christians. I love those tales of people who were woken at 3am and they hear the distinct, determined voice of God, turns out God is chatty at 3am. God tells them of what they need to do, he gives them a mission, a dream. If that was me I would be flaunting my new job assignment with all the obvious exaggerations of a newly engaged woman. “Oh, what?….this?? ?…Oh, just a little thang God called me to do…no, like he literally spoke to me…so yeah, I’ve been ‘called’ “. But it really doesn’t happen so obviously for everyone. Take Nehemiah for instance, he heard about the Jews who had returned to their Jerusalem. It was once glorious with its giant walls, now these walls were broken and burned – a symbol of defeat. He wept, he got fired up, he prayed to God and asked God to make him successful in rebuilding the walls. Then he just went for it, he didn’t wait on God to give him the nod, or for it to fall into his lap. He went for it, and it happened. He wasn’t called, he didn’t have to be. The only dreams most of us pursue are the ones that are within reach. The safe ones. When we are only doing those things in our capacity and with our own resources, we are doing them independently of God. A common question to ask is ‘what dream do you have that is so big, that you know it would only happen by the hand of God?’. Those are the dreams we need to be listening to because they take us out of our comfort zone, where God always meets us. When we are dreaming with God, for God, because of God, then we are dreaming his dreams for our lives and he will take care of the ‘how’ so we can focus on the ‘what’. So often we can see dreams in others but are quick to dismiss them for ourselves. I find myself doing this anytime a dear friend of mine points out some great project I could take on, I react all weird and defensive, “well maybe YOU would be amazing at that!”. It is because we are our own inward critics when we need to be outward perceivers. Our dreams shouldn’t look like anyone else’s, so neither should our skills and passions. We need some self-perception into those unique gifts and strengths we have to offer the world. If you are feeling unqualified to dream, you can thank God for friends who are speaking truth in your life. You can pray for God to give you some self-perception, to bind up the lies you are listening to about your abilities, pray for discernment in your own unique passions, and get to know your strengths (more on this soon!). The word ‘dreaming’ can bring on notions of a life’s purpose that we need to uncover. It is great if you find it, but for many of us, we don’t have this major Mother-Teresa-level life calling. For many of us, life is a series of little dreams. It is a series of ways we can merge our passions, our talents and our desire to get closer to God in all we do. A dream can be a vision of your ideal day or an idea of a project you want to take on. Dreams can be simple because dreams are often a stepping stone rather than a destination. 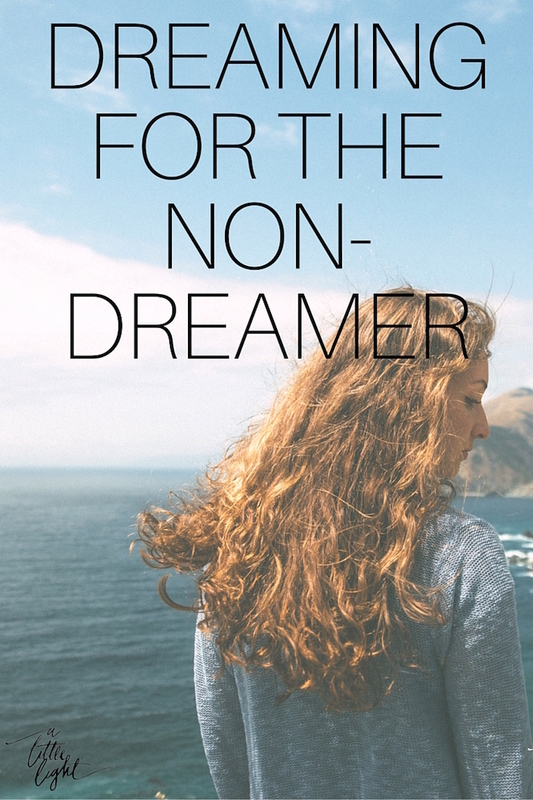 Do you consider yourself a non-dreamer? What hurdles do you face in ‘dreaming’? Save the date on your calendar for the evening of April 28th so that you can join A Little Light and Elsie Road Magazine for an online webinar all about dreaming. More details to come. . . .